Cocoa Beach, FL is probably best known for its beautiful beach, famous surf breaks, and proximity to the Kennedy Space Center Visitor Complex. It is the perfect destination for a family vacation to remember. The historic Cocoa Beach Pier stretches 800 feet over the Atlantic and features an array of gift shops, bars, restaurants, and live music. Every kind of water adventure, from kayaking Banana River’s Thousand Islands to deep-sea fishing with Fin and Fly Fishing Charters to taking a few surf lessons from Ron Jon’s, is available here. There are unique treasures like The Dinosaur Store and can’t miss attractions like Exploration Tower. These 20 things to do in Cocoa Beach, Florida are crowd pleasers for all ages. Astronaut Memorial Planetarium & Observatory on the Eastern Florida State College campus has been serving both the college and the community since 1975. It is widely recognized as one of the best planetariums in the United States, and the rooftop observatory has one of the largest public telescopes in Florida. Planetarium staff and volunteers help visitors explore the night sky every weekend. The planetarium also has two theaters. Star Theater has the world’s first combined Digital & Optical Mechanical projection system for realistic views of the Brevard County night sky and presents live tours of the night sky. It also hosts laser/music shows. Discovery Movie Theater shows IMAX, National Geographic, and other science documentaries. Banana River Aquatic Preserve is nestled between Merritt Island on one side and a beach barrier island on the other. The 30,000-acre preserve has a number of parks and boat ramps that provide direct, easy access to visitors with their own or rented boats and kayaks. These include Banana River Park, Kiwanis Island Park, Cocoa Beach Recreational Complex, and Kelly Park, among others. The north end of Banana River is home to a large manatee population year-round, but visitors will also see a large pelican rookery and significant numbers of diamondback terrapin turtles and alligators. Ulumay Wildlife Sanctuary in the preserve is a bird watcher’s paradise. 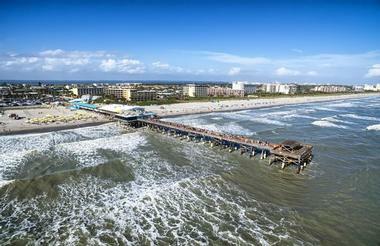 The world-famous Cocoa Beach Pier draws over a million annual visitors. The iconic Central Florida landmark stretches 800 feet out above the Atlantic Ocean and has numerous gift shops, restaurants, and bars for visitors to enjoy. This family-friendly attraction is also known for its great fishing opportunities. Anglers are likely to catch red fish, whiting, snapper, wahoo, and many other types of fish. There is a fishing fee for those who bring their own equipment, and there is also an option to rent equipment at the pier. Some of the most famous surfers in the world surf here, and visitors can watch the action at Mai Tiki Bar at the pier’s end. Exploration Tower is a must-do activity at Port Canaveral Jetty Park. The architecturally gorgeous seven-story tower is a recreational offering by the Canaveral Port Authority. Visitors enter the tower via a promenade that skims across a lake. The first floor houses the information desk, gift shop, and a café. The tower’s second floor is a 2,750-square-foot discovery center with interactive exhibits about local history. On the third floor, there is a 72 seat state-of-the-art theater to watch a one-of-a-kind historical movie. The Tower’s fourth floor hosts meetings and events. Floor five offers a simulated harbor boat pilot navigation experience, and floors six and seven are indoor and outdoor observation decks for Cape Canaveral launches. Florida Surf Museum is dedicated to preserving the unique history of East Coast surfing. Visitors can expect to see exhibitions about the history and culture of Florida surfing, the evolution of surfing, great local surfers, five iconic local surf spots, and a fascinating array of boards. Besides the permanent collection of photos, videos, boards, and stories about surf legends and big Kahunas, there are always new temporary exhibits. Past exhibits have included Shortboard Evolution Revolution, Sidewalk Surfing, Locals Only, Florida Women of the Waves, Paipo: Prone to Ride, and Gary Propper – Surf/Art/Entertainment. Visitors can also purchase T-shirts and other souvenirs from the museum. The Helen & Allan Cruickshank Sanctuary is part of Florida’s Environmentally Endangered Lands program, which was established to acquire land that is environmentally sensitive and bring it back to life for environmental education and passive recreation. Once a turpentine mine and farm, this 140-acre sanctuary is an example of conservation in action. The pine flatwoods habitat is now home to raptors that circle above the pines or perch majestically at their tops. The restored land also includes oak trees and sand pine scrub, along with freshwater marshes. Visitors here can walk the mile-long nature trail that loops the sanctuary and observe native wildlife. Historic Cocoa Village is a must-do on any vacation to Cocoa Beach. Cocoa Village is the in-demand entertainment and shopping district of Cocoa, Florida. Visitors meander tree-lined streets perusing a plethora of unique shops and casual dining establishments in a village atmosphere. Depending on the time of year, travelers to Cocoa Village may catch one of four annual art fairs, two car shows, or four annual Sip and Strolls. The Village, founded in 1860, has numerous historic attractions to see, like Porcher House and Cocoa Village Playhouse, both of which are on the National Register of Historic Places. Cocoa Beach has long been considered the gateway to NASA’s Kennedy Space Center, and the Space Center Visitor Complex is 40 minutes outside Cocoa Beach. 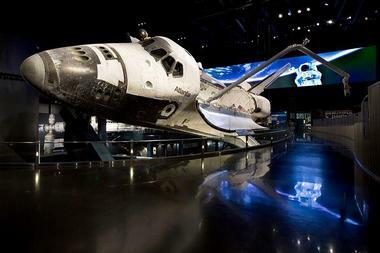 Visitors to the center will see historic spacecraft and memorabilia, the U.S. Astronaut Hall of Fame, astronaut training simulators, a space shuttle launch experience, a close-up view of the space shuttle Atlantis, Space Mirror Memorial honoring fallen astronauts, and so much more. There are a number of add-on attractions at the Visitor Complex for an additional price. Some of these include photo opportunities with icons of NASA spaceflight operations, a guided tour with an astronaut, live action gaming featuring real NASA missions, and lunch with an astronaut. South of Cocoa Beach Pier, visitors will find picturesque, regional beachside Lori Wilson Park. To get to the semi-secluded beach, travelers take one of the short trails past the boardwalk, through the woods, and over the dunes to the beach. Park facilities include picnic tables, two pavilions, restrooms and changing areas with vending machines, a lifeguard stand, and an elevated boardwalk nature trail through an adjacent tropical maritime hammock (forest). Other park amenities for public use are a volleyball court, playground, barbecue grills, and a dog park. The park opens at dawn and closes at dusk. There is no park fee for any of the facilities or the beach. The family-friendly Cocoa Beach and Thousand Islands Helicopter Tour provides an exhilarating birds-eye view of Cocoa Beach, Port Canaveral, and Thousand Islands in Banana River. The 30-mile, 15-minute flight leaves from a private helipad in Port Canaveral. Guests can expect to see miles of Cocoa Beach and Cocoa Beach Pier with tons of surfers and beach goers along the way. The inter-coastal Banana River has a labyrinth of natural and manmade islands, some freshwater manatees, and even a few river dolphins. Tours regularly accommodate two guests, who will each have headsets allowing them to clearly hear the guide’s live commentary. Sands Space and History Center is an extension of the Air Force Space & Missile Museum at Cape Canaveral, Florida. Since it is outside the Cape Canaveral Air Force Station, there is no need for an access pass, and admission is free. The history center preserves and displays historic information for the Launch Complexes at Cape Canaveral. There is also a gift shop inside and a picnic area outside the building. Visitors can tour the history center every day except Monday. This is not the Air Force Space & Missile Museum itself, which is at Launch Complex 26 inside Cape Canaveral Air Force Station and can only be accessed via a bus tour called, Cape Canaveral Early Space Tour. Shepard Park gets its name from astronaut Alan Shepard, the first American in space. Besides being an oceanfront park, it’s also the perfect spot to watch future Cape Canaveral launches. This five-acre park has a beautiful beach, picnic shelters, a children’s playground, 10 large picnic pavilions, barbecue grills, vending machines, and a bathhouse with showers, changing areas, and restroom facilities. There is also an option to rent beach chairs and umbrellas for a relaxing day. The paid parking lot with 300 spaces is close to the beach. This is the perfect set-up for a fun day at the beach. The Fat Snook is a casual beachside restaurant that has been serving upscale dishes to the Cocoa Beach community since 2007. They specialize in showcasing local purveyors of fresh seafood and use seasonal ingredients in their amazing entrées like Poblano Pesto Shrimp with Canaveral shrimp, pumpkin cheddar grits, and chorizo cream sauce. Other menu standouts like their Florida Stone Crab starter, Grilled D’Anjou Pear & Baby Gem salad, and U-10 Seared Scallops entrée are local favorites. The casual-chic ambience features a cool color palette of blues and greens with wood flooring, beachy accents, and modern bistro tables and chairs. The Dinosaur Store is not a kitschy roadside stand with plastic dinosaur souvenirs – it’s the real deal. 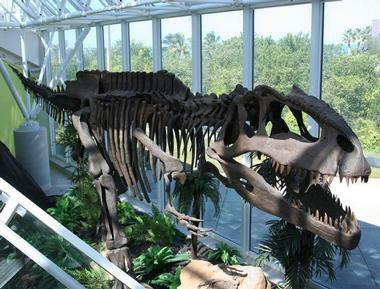 The world’s largest collection of fossils and minerals will inspire paleontology fans. Shoppers can pick up a 65 million-year-old authentic Pachycephalosaurus toe for $2400 or a 75 million-year-old real Tyrannosaurid tooth for $900, and there are many more one-of-a-kind pre-historic items. Families will love The Dinosaur Store’s Adventure Zone where kids can explore science center activities, play arcade games, watch dinosaur movies in the Movie Cave, pan for fossils in a working sluice, and visit live gators and reptiles in the Reptiles Run. The Dinosaur Store also presents a Museum of Dinosaurs and Ancient Cultures. 321 Kiteboarding and Watersports is a retail kiteboard and surf shop. But that isn’t all they do. They’re also the largest kiteboarding school in Cocoa Beach. Students learn to set up the gear and use it safely, then head out to the water to learn how to harness the wind for kiteboarding. 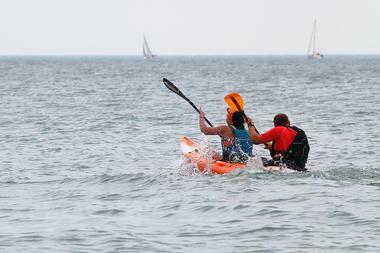 The only requirement is the bit of endurance it requires for beginners to spend one to two hours on the water learning skills, along with some core and leg strength. 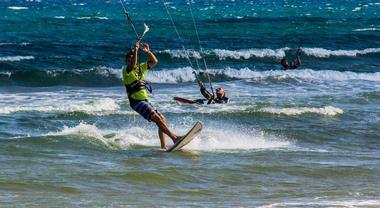 Kiteboarding is an exciting sport for everyone, from kids to seniors. The best time for kiteboarding in Cocoa Beach is October to May. The store offers gear for purchase or rent and lessons in kiteboarding, SUP, and surfing. Vacationers who want to see the natural side of Cocoa Beach can explore mangrove tunnels and islands on a kayak eco-tour of Thousand Islands. Daytime kayak tours are approximately two hours long. Kayakers should expect to see manatees, dolphins, white ibis, bald eagles, southern stingrays, and other wildlife on guided tours through a diverse eco-system. Leisurely tours leave both mornings and afternoons from various locations and are appropriate for all skill levels – even those who’ve never kayaked before. For an even more unique experience, kayakers can choose a nighttime bioluminescence kayak tour or comb jelly tour (also bioluminescent) where paddlers will see these living lights emit an ethereal blue-green glow in the water. Cocoa Beach Brewing Company is tucked away in a historic building that was once 1930s Navy housing. Today, the repurposed former Banana River Naval Air Station provides retail space for a number of restaurants, bars, and local businesses. This family-owned-and-operated nano-brewery and pub, founded in 2008, was the Space Coast’s first brewery. 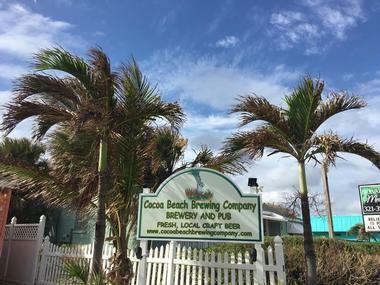 Cocoa Beach Brewing Company specializes in traditional craft brews, plus unique seasonal beers. 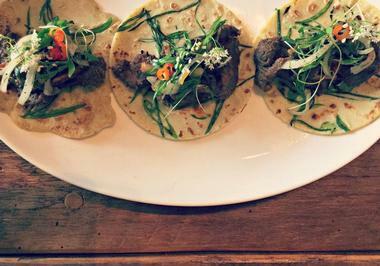 Their award-winning beers are handcrafted in small-batch brews. Three beers to try are the Cocoa Beach Pale Ale, Not Just Some Oatmeal Stout, and 888 India Pale Ale, all award winners. Fin and Fly Fishing Charters offer enthusiastic anglers both deep sea and inshore fishing charters. Founder and Captain Jamie Glasner and Captain Alex Hughey grew up fishing the waters of Cocoa Beach, including the Banana and Indian Rivers and the Space Coast. 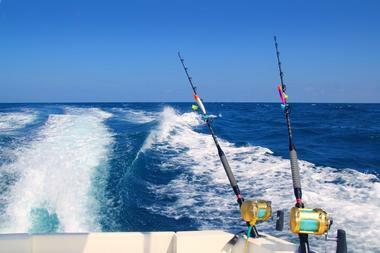 Both captains specialize in nearshore and inshore fishing, along with deep sea fishing. Anglers can also feel confident about their four charter boats. The 32-foot Blackfin Sportfishing boat is perfect for offshore fishing, while the 168 Phantom Ranger has superb shallow water performance. The 16-foot Action Craft is a fly fisherman’s dream boat, and the Skeeter 24-foot boat is the workhorse of the bunch going wherever the fish are. Fin and Fly Fishing Charters offer deep sea, river, inshore, shark, and red snapper charters. 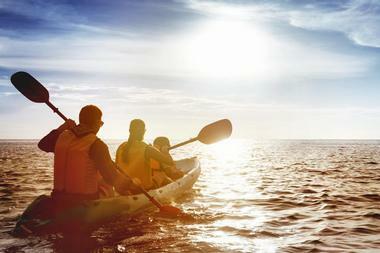 Fin Expeditions offer personalized, small group kayak eco-tours in the Banana River Lagoon. Local expert guides lead groups of ten or fewer kayakers through the labyrinth of the Thousand Islands mangrove forest. Groups are typically six kayakers to one guide who takes them off the beaten path and expertly leads them through the sometimes confusing watery trails with ease. This is a “Do Not Disturb Ecotour” that emphasizes passive observation and environmental respect rather than petting, feeding, and otherwise bothering wildlife. 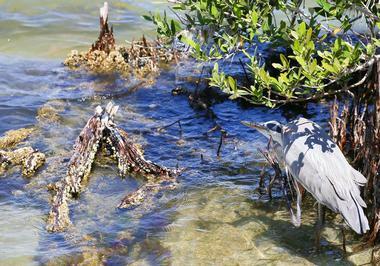 Kayakers can expect to see red, black, and white mangroves, dolphins, manatees, and a variety of birds and other wildlife. Tours are cash only. Ron Jon Surf School began as Cocoa Beach Surfing School in 1993 by one of surfing’s champions, Craig Carroll. The establishment draws on 45+ years of surfing and coaching, so guests can be assured they’ll be well taught whether they are beginners or serious competitors. Ron Jon offers private and semi-private surf lessons for beginner and advanced surfers. Surf Camp for kids seven to 17 who can swim is held between May and August. Camps run for five days, perfect for a weeklong vacation. Ron Jon also provides stand up paddle boarding instruction via private or semi-private lessons, along with stand-up paddle boarding eco-river tours and nighttime bioluminescent SUP tours. They have recently added kiteboarding instruction to their repertoire.